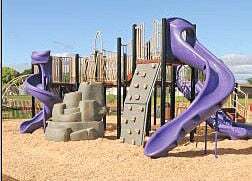 Playground equipment is pictured at Andy Pafko Memorial Park in Boyceville in this 2014 file photo. Boyceville has received a $5,000 grant to help attract and retain businesses and residents, especially young families, strengthen the community, welcome tourists and keep improving safety. The REALTORS Association of Northwestern Wisconsin applied for the national-level placemaking grant that Boyceville received, according to a news release. The top five areas in the village of Boyceville that will be addressed are Pafko Park, Main Street and downtown, the East Street-Highway 170 intersection, Freedom Park and Airport and community entrances, the Better Boyceville Committee and West Central Wisconsin Regional Planning Commission found. “New signage, improved lighting, additional bike racks, and steps to improve both recreation and safety will make a positive impact on those that live and visit Boyceville," said RANW Executive Vice President Brenda Barnhardt. The REALTORS Association of Northwestern Wisconsin is the professional trade association that all professional realtors residing within the association jurisdiction belong to. The association provides educational opportunities for its members, is active in local, state and national advocacy efforts, engages in community outreach through charitable giving, operates its own private foundation to help homeowners in need and remains a positive force for the members they serve.